As our nation debates gun laws, we celebrate all of YOU, the Children of the World. May we all grow together into healthy grandmas and grandpas who dance and sing. This year our Parade and Ceremony enact an honest, cautionary tale inspired by the Bread and Puppet Theater's street show Hallelujah. Bread and Puppet has performed this strikingly simple piece all over the world since 1972. Description: We remember how precious our home is in this vast universe. Recordamos cuán precioso es nuestro hogar en este vasto universo. What we see: The Tree of Life joyfully carries the small ball of the Earth surrounded by Stars. The Woods, the Prairie, the Sky and the River join in the celebration. Your Community Band brings its essential joy to the parade for the 35th year! Inspiration: The Tree of Life and the four Big Ones (the Woods, the Prairie, the Sky and the River) are part of our tradition of MayDay every year in the Tree of Life Ceremony in Powderhorn Park. This year they join in the story of the parade for the important job of helping us SEE THE WORLD. Section 2: When you put fire to the world and when you poison it. / Cuando usted pone fuego al mundo y cuando lo envenena. Description: The labors of our time are pictured vividly. You see our continued complicity in war and the violence on our streets; our overuse of fossil fuels with the result of global warming and environmental havoc. Los trabajos de nuestro tiempo se representan gráficamente. Usted verá como nuestra complicidad continúa en la guerra y la violencia en nuestras calles, nuestro uso excesivo de combustibles fósiles con el resultado del calentamiento global y la destrucción del medio ambiente. What we see: The World is Divided into two halves. A Large Figure sets one half of the world ablaze and stirs a toxic mix in the other half. This toxic sludge becomes batter in the climate controlled Easy Bake Oven. The oven bakes at a "climate scourge" setting, making inedible sugar cookies of cars, guns, pills, bombs and drones. Large hands have two actions: Fire, and Hush! They point in gun-like intimidation and cover mouths to hush participants and the audience. The Clowns are fools like us, parading their possessions in shopping carts, offering the sugar coated "cookies" for our consumption. Drones fly in flocks overhead. We move forward like these happy clowns, and what we leave behind is increasingly hellish. Inspiration: Paintings and prints by Francisco Goya. "The sleep of reason produces monsters," 1797 from Los Caprichos. "Bobolicon in Disparates," 1815-1823. Section 3: The World Will Cry and the Children Will Die. / El mundo va a llorar y los niños van a morir. 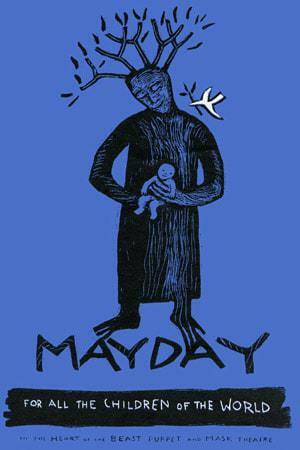 Description: Quietly, in the midst of the joyous celebration of MayDay, we simultaneously hold our grief and the vision of a future of health and well being for our neighborhoods and for the world. En silencio, en medio de la alegre celebración de MayDay, que al mismo tiempo mantenemos nuestro dolor y la visión de un futuro saludable y el bienestar de nuestras comunidades y para la comunidad mundial. What we see: The Tree of Life cradles the Wounded Earth. Spirit Beings carry Prayer Staffs that hold prayers for the life of the world offered by MayDay workshop participants. A larger, shrouded figure of the Tree of Life is carried following the spirit beings — on its way to Powderhorn Park for the Ceremony. Everything is quiet and White. The Tree of Life and all the Spirit Beings are white. White is often associated with purity and light, and in many traditions it is also the color worn in ceremonies to honor the dead. White carries a sense of an open window, of wind, of smoke, of transparent quietness. Section 4: When You Sow Seeds On the World and When You Put Water On It. / Cuando sembras semillas y cuando le pones agua. Description: Here we celebrate seeds, hope, and the gritty yet nurturing labor required in tending to their growth. An incredible force, the seed: such potential inspires a true feeling of awe. But the seed alone doesn't become a tree. In Korea, there is a name for the forces that help the seed to grow. That word — 운우풍뢰 — translates to wind, cloud, water and lightning. Deep changes may be slow in coming, as the seed takes time to germinate, but with each planting springs forth the dream of a new beginning. Aquí celebramos las semillas, la esperanza y el trabajo valiente aún nutritivo necesaria en el cuidar su crecimiento. Una fuerza increíble, la semilla: ese potencial inspira un verdadero sentimiento de admiración. Pero la semilla solo no se convierta en un árbol. En Corea, hay un nombre para las fuerzas que ayudan a que la semilla crezca. Esa palabra 운우풍뢰 se traduce al viento, las nubes, el agua y el relámpago. Profundos cambios pueden ser lentos en llegar, ya que la semilla necesita tiempo para germinar, pero con cada uno de los resortes de plantación sucesivamente viene el sueño de un nuevo comienzo. What we see: The Laborers ritualize the act of sowing seeds and pouring water. Seed Arks roll down the street with real live sprouted seedlings ready to be distributed in the park. Water Umbrellas glide through the air, pouring water on us. Larger than Life Seeds pop open, and hopes and dreams for the future emerge. Seed Mothers open their bellies to reveal tiny seedlings growing inside, reminding us how we must care for the earth as we care for our bodies. Description: Our humanity must come to the rescue. You have your mind, your heart and your hands. You're the one who can turn this world into a paradise. Nuestra humanidad tiene que venir al rescate. Tiene su mente, su corazón, y sus manos. Usted es el único que puede transformar este mundo en un paraíso. Section 5: And Let the Sun Shine On it. / Y dejar que el sol brille sobre él. Description: The children are our greatest joy and promise. Let the laughter come; let the happiness spread from one face to another to another as we celebrate MayDay together! Wearing yellow suns, sunshine crowns, and flowing capes, our children are the royalty of the sun. We give them an opportunity to show us how very beautiful they are. Smile and catch the eyes of a child. Come shine with us! Los muchos son nuestra mayor alegría y promesa. Deja que la risa venga, deja la alegría contagia de una cara a otra a otra a medida que celebramos MayDay juntos! El uso de soles a marillos, coronas de sol y capas fluidas — nuestros niños son la realeza del sol. Les damos la oportunidad de mostrarnos cuán bellos son. Sonría llama la atención de un niño. Venga a brillar con nosotros! What we see: A May Pole topped by our lovely sun extends its glorious light, as ribbon rays flow out in a great circle. The sun is the source of all energy in our world. Revelers circle the sun — dancers, roller skaters and bicyclists — and celebrate its gifts: movement, light, energy, and joy! Solar Lanterns designed by Communities of Light. Co-op members carry the sun's light in them through the night. Section 6: It Will Grow! / ¡Va a crecer! Description: Definitions of "to grow": develop, thrive, change! This is a celebration of constant movement, springing up to existence from a source, evolving gradually into being. The simplest truth is that deep within each of us is a spark, a desire to grow and connect! This is so simple that we sometimes forget that for growth one must allow a thing be itself, to grow in its natural way. Bend to these living beings and whisper, "grow, grow, grow." We are the breath, a wind at work in the world. We are the spinning and the rocking. We desire connection. We reach up, grow up, grow together as a community. Can we be at one with wild nature? Our work on the planet is the earth's work. Las definiciones de "crecer": desarrollar, prospesar, cambiar! Esto es una celebración del movimiento constante. La verdad más simple es que en lo profundo de cada uno de nosotros es una chispa, un deseo de crecer y conectar! Esto es tan simple que a veces nos olvidamos de que para el crecimiento se debe permitir que una cosa sea sí misma, para crecer en su forma natural. Bájase a estos seres vivos y susurre, "crezca, crezca, crezca." Somos la respiración, el viento que trabaja con el mundo. Somos el girar y el balancéo. Deseamos conexión. Alcanzamos arriba, crecemos, crecemos juntos como una comunidad. ¿Podemos estar en una con la naturaleza salvaje? Nuestro trabajo en el planeta es el trabajo de la tierra. What we see: Marionette Flowers spinning our bonds to the world and the living things in it. Trees of Life move and bend. We work and live! Stilting Flowers and Grass rise up to the sky. Flying Flowers flow with the winds of change. Garden Wagons carry visions of new ideas. Inspiration: "I think the inability to love is the central problem, because the inability masks a certain terror, and that terror is the terror of being touched. And, if you can't be touched, you can't be changed. And if you can't be changed, you can't be alive." -James Baldwin, from an interview first published in The Advocate and excerpted in the Utne Reader, July/August 2002, p. 100. Section 7: And the Birds Will Feed On It, and the Children Will Eat It. / Y los pájaros se alimentaran de ella, y los niños del mundo van a comer en él. Description: Food is the most basic of our physical needs. The same grain that the birds feed on is transformed by humans into our staff of life – bread. In this way the grain, fruit of the earth, the water, and the sun, connect us to the circle of life and bring us into real community. We honor this community with gratitude, respect and generosity. In the act of thanksgiving we are all creatures of the world, no matter what our species. Humans, animals, plants, even minerals — with all their inherent potential — are equal in this cycle, and all have a purpose. La comida es la más básica de las necesidades físicas. El grano mismo en que las aves se alimentan es transformado por seres humanos en nuestro personal en la vida – el pan. De esta manera, los granos, las frutas de la tierra, el agua, y el sol, nos conectan con el círculo de la vida y nos conviertan a una verdadera comunidad. Honramos a esta comunidad con gratitud, respeto y generosidad. En el acto de gracias, todos somos criaturas del mundo, no importa nuestra especie. Los seres humanos, animales, plantas, minerales – incluso con todo su potencial inherente – son iguales en este ciclo, y todos tienen un propósito. What we see: Birds beautify the air with songs of freedom and the spirit of survival. Baby Animals remind us that all the world's children need to be cared for. Bread shows us the seed transformed, and Bakers prepare food that nourishes the body and spirit. Section 8: And the Grandmas and Grandpas Sing Hallelujah! / Y las abuelas y abuelos cantan aleluya! Description: The grandmas and grandpas, both human and animal, sing hallelujah because they have the wisdom to know the value of joy and gratitude. Life is short. The best thing we can do is find moments of happiness and remember to take in the beauty that surrounds us. Las abuelas y abuelos, tanto humano como animal, cantan aleluya, porque tienen la sabiduría para reconocer el valor de la alegría y la gratitud. La vida es corta. Lo mejor que podemos hacer es encontrar momentos de felicidad y recordar a disfrutar de la belleza que nos rodea. What we see: Elders from our extended MayDay family ride as honored figures on floats, distributing Pearls of Wisdom. These pearls include little phrases, ancient truths, and bits of culinary or healing knowledge collected during the parade workshops. Here in the midwest there are elders who can stay out on the dance floor all night – longer than people decades younger. As these Grandmas and Grandpas boogie to our Square Dance Band they will share the secret to that vitality: a connection to joy and a focus on what is important. Moose are disappearing from the Minnesota wilderness. The DNR reported a mysterious 35 percent decline in the moose population from 2012 to 2013. This is a great loss. The Great Great Great Grandpa Moose is a spirited giant of our forests, and a symbol of how we need to live more intentionally. We think of the moose as our ancestor, to remember how we are connected to this creature. Twine your work in harmonious union with the work of this Beautiful World. Find each other. Feel your feet rooted to the ground. Engage minds, hearts, hands. Plant, water, thank the sun eat together, sing together! Combinen su trabajo en armonía con el trabajo de este Hermoso Mundo. Encuéntrense, Siéntanse sus pies sobre la tierra. Realizer mentes, corazones, manos. Planter, agradezcan al sol, comer juntos, cantar juntos. This year our Tree of Life Ceremony enacts the street show titled Hallelujah from the Bread and Puppet Theater of Vermont in honor of their 50th year. The Bread and Puppet Theater is one of the original inspirations for the formation of In the Heart of the Beast Theatre 40 years ago. We thank them for their provocative work, which has influenced art and activism around the world for so many years. It is a privilege for us to perform Hallelujah in Powderhorn Park today with Peter Schumann's original woodcut prints. First used by Bread and Puppet in 1972, these prints have since traveled the world. Este año nuestro Árbol de la Ceremonia de la Vida promulga el "espectáculo," titulado "Aleluya" del Bread and Puppet Theater de Vermont, en honor de su 50 aniversario. El Bread and Puppet Theater es una de las inspiraciones originales que formaron In the Heart of the Beast Puppet and Mask Theatre hace 40 años. Les damos las gracias por su trabojo provocativo, que ha influenciado en el arte y el activismo en todo el mundo durante muchos años. Es un privilegio para nosotros llevar a cabo "Aleluya" en el parque Powderhorn hoy, con grabados de pinturas originales de Peter Schumann. Estos fueron utilizados por primera vez por el Bread and Puppet Theater en el año 1972, estas impresiones desde entonces han viajado por todo el mundo. What is our work at this critical time? Are we hospice workers for a dying Earth, or midwives of a new chapter of life on Earth?